The last few passengers were hurrying aboard even as the ferryboat began to pull against her mooring lines. A well-dressed Mandinka trader bustled onto the deck ahead of a couple of porters hauling a cartload of bright fabric. A Jola man in tattered shorts wrestled a wheelbarrow of green coconuts up the ramp. The ferryboat horn blared out once – momentarily drowning the shouts of the attaya (tea) vendors – and the clattering diesel engines began to shove us laboriously out into the mist-shrouded expanse of the great Gambia River. I found a place on the wheelhouse stairway from where I could look down on the packed decks below. Among the pushing, shouting, panting figures I noticed three elegantly formal Wolof women, chattering excitedly. One of them, dressed in a traditional blue mbuba gown and wearing a matching head-wrap, turned to gaze northwards, to where our destination on the northern banks now showed as just a faint line, topped here and there with the shaggy heads of wind-battered palms. As she leaned on the rail the gown slipped slightly and a perfect heart-shaped section of her brown shoulder was revealed against the blue of the churning current. 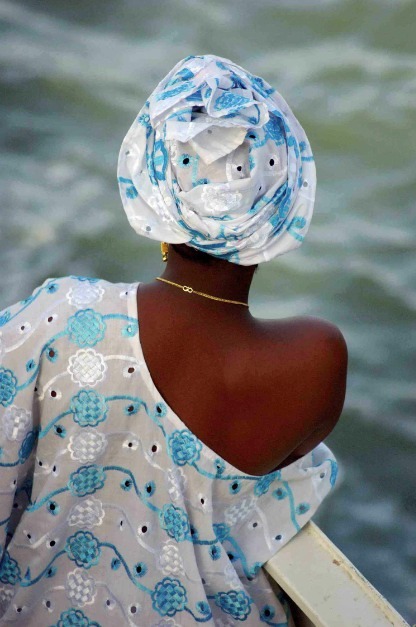 It was one of the moments of beauty that crop up so frequently in The Gambia. Yet another indelible memory that makes a journey along the Gambia River one of the most enticing travel experiences Africa can offer. Into photography? Take a read here for tips on shooting portraits, and for general advice on taking better photographs on your travels, please click here. For more images in our Behind The Lens series, please click here. Oh! I could live with this photograph on my wall … And never get tired of it. Thanks for your kind comment Anita. Sometimes a photographer is lucky enough to be on the spot when an unforgettable image presents itself. We just have to be ready to focus and snap. I think I might know that ferry well – Barra-Banjul? I always feel decidedly scruffy next to the women on there. Beautiful image and imagery…it makes me want to be on that very ferry right this minute. [photograph © Dale Morris] British born wildlife photographer Dale Morris has built a reputation as one of the most widely published photographers in South Africa….